It's my favourite time of the year, no not summer, I am talking about The Allergy & Free From Show. As a consumer with allergies it is a great opportunity to discover newly launched products plus stock up on favourites which are not easy for me to get a hold of. 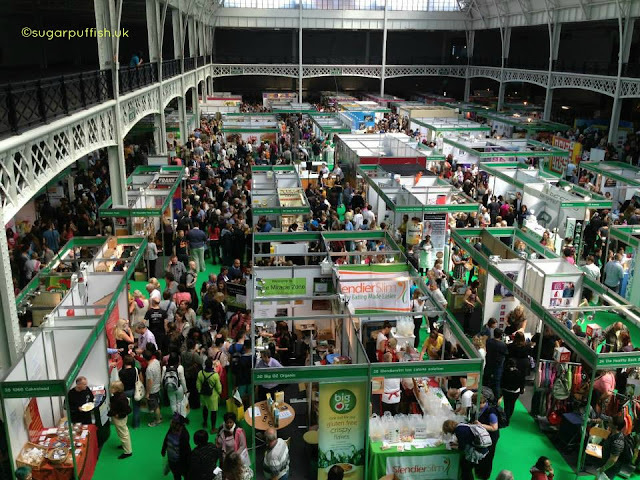 This year a section of the show was dedicated to Vegetarian and Vegan produce (Vdelicious). Unfortunately, I noticed once again it attracts some negativity. People think the dividing line should have been clearer or in fact held in a different hall. As a non meat eater with milk and egg allergy, I have an interest in Vegan products. It would seem that many people with more complex allergies obviously find it not a suitable diet option. I think it's impossible to decide what should or should not be present at the show. Those tissues they hand out at the door, I'm allergic to those! I have to say I did find the show dominated by the Gluten Free market. That comes as no surprise to me since there is definitely a trend making it a 'fashionable' diet, but that's a debate for another day. Dairy free seems widely available but as always egg free is harder to find. When it comes to egg free you have to ask the question. I've complain before on my blog how companies do not prominently display they are egg free, ilumi were guilty of this amongst others. Here's my haul from the show. I was also on the hunt for products for my sister who is Coeliac. Aside from Bathing Beauty I did not discover any new beauty brands, most of them I am already familiar with. To be honest my main focus for the day was on the food, typical me always thinking about where my next meal is coming from. Did you visit the show? Anything from my haul catch your attention? Let me know in the comment section below. ** Please check with companies for specific allergy advice to ensure suitability for your diet. I am referring to the products I purchased which are pictured above. As you can see both my sister & I are a fan so hence the two boxes. I unfortunately can not experience the orange one as it's one of my allergens.